The ISF, StyleLine 106 and Duplex Outlet Frames provide instant communication mounting capabilities within a rectangular (GFCI) or duplex electrical design. These frames deliver 2 to 6 port configurations, lending flexibility and increased capacity to the work area. Infin-e-Station frames give a contemporary finish to any style application and can accommodate a broad range of retrofit applications. Compatible with out Infin-e-Station cover plates, the frame's aesthetic appearance provides a consistent match next to any Infin-e-Station plate, module or surface mount box. All frames are unloaded with the exception of the SL5E4 frames, which are pre-loaded with a 4-port Cat 5e jack adapter. Click here to view Hubbell's Infin-e-Station Frames and Plates PDF. Infin-e-Station plates provide a sleek, contemporary look in the work area. These plates offer security in the work area through rear loading and ANSI/TIA/EIA-606-A station labeling capability. Two labeling options are included: paper labels with clear covers and color matched covers for use with adhesive labels. The AFP series plates are designed with 45" angle mounting, which provides a protected installation profile when patch cords are installed. SSF plate series provides flush mounting for all jacks and Snap Fit (SF) connectors in stainless steel for special applications such as hospitals, education systems, manufacturing plants, etc. 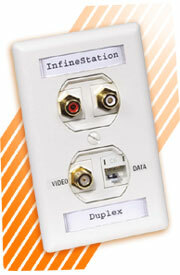 Click here to view Hubbell's Infin-e-Station Face Plates (Rear-Loading) PDF.